You know where I’d love to be January 23 – 27? I’d love to be back down at El Pescador for a three day tagging tournament, benefiting the Bonefish and Tarpon Trust (ya know, if we put together a group, I probably COULD come down for this… just say’n). This is put on by the good folks at El Pescador and their stable of excellent guides. Here’s the skinny. 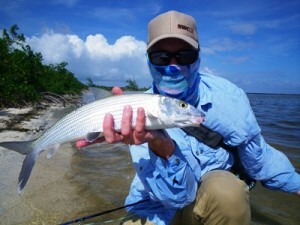 Belize, Bonefish… I dig it. El Pescador will donate US$250 for every paying angler entering the 2nd Annual Grand Slam Tagging Invitational to benefit BTT. The total sum raised will be donated in the tournament grand champion’s name to BTT. The grand champion with then receive the corresponding benefits associated with that level of membership. The grand champion will also receive one (1) spot, with the entry fee waived, to compete in the 2014 March Merkin invitational permit tournament in the Florida Keys. El Pescador has worked with BTT and their tagging program since 2009. We tag permit, bonefish and tarpon in order to answer basic questions about population, growth rates and movements. This entry was posted on Tuesday, October 9th, 2012 at 1:05 am	and is filed under Conservation, Locations. You can follow any comments to this entry through the RSS 2.0 feed. You can leave a comment, or trackback from your own site. Group? I might be interested, either that or it is just too early in the morning and I haven’t had enough coffee to be thinking clearly about possible spousal reactions. It would be awesome, wouldn’t it? I would strongly consider this. Hey Bjorn, Please keep me posted on this idea. Thanks!